Development of Windows XP began in the late 1990s as "Neptune", an operating system (OS) built on the Windows NT kernel which was intended specifically for mainstream consumer use. An updated version of Windows 2000 was also originally planned for the business market; however, in January 2000, both projects were scrapped in favor of a single OS codenamed "Whistler", which would serve as a single OS platform for both consumer and business markets. As such, Windows XP was the first consumer edition of Windows not to be based on MS-DOS. Upon its release, Windows XP received generally positive reviews, with critics noting increased performance and stability (especially in comparison to Windows ME, the previous version of Windows aimed at home users), a more intuitive user interface, improved hardware support, and expanded multimedia capabilities. However, some industry reviewers were concerned by the new licensing model and product activation system. Extended support for Windows XP ended on April 8, 2014, after which the operating system ceased receiving further support or security updates to most users. As of March 2019[update], 1.75% of Windows PCs run Windows XP, and the OS is still most popular in some countries with up to 38% of the Windows share. In the late 1990s, initial development of what would become Windows XP was focused on two individual products; "Odyssey", which was reportedly intended to succeed the future Windows 2000, and "Neptune", which was reportedly a consumer-oriented operating system using the Windows NT architecture, succeeding the MS-DOS-based Windows 98. However, the projects proved to be too ambitious. In January 2000, shortly prior to the official release of Windows 2000, technology writer Paul Thurrott reported that Microsoft had shelved both Neptune and Odyssey in favor of a new product codenamed "Whistler", after Whistler, British Columbia, as many Microsoft employees skied at the Whistler-Blackcomb ski resort. The goal of Whistler was to unify both the consumer and business-oriented Windows lines under a single, Windows NT platform: Thurrott stated that Neptune had become "a black hole when all the features that were cut from [Windows ME] were simply re-tagged as Neptune features. And since Neptune and Odyssey would be based on the same code-base anyway, it made sense to combine them into a single project". At PDC on July 13, 2000, Microsoft announced that Whistler would be released during the second half of 2001, and also unveiled the first preview build, 2250. The build notably introduced an early version of Windows XP's visual styles system. Microsoft released the first beta build of Whistler, build 2296, on October 31, 2000. Subsequent builds gradually introduced features that users of the release version of Windows XP would recognise, such as Internet Explorer 6.0, the Microsoft Product Activation system and the Bliss desktop background. On February 5, 2001, Microsoft officially announced that Whistler would be known as Windows XP, where XP stands for "eXPerience". In June 2001, Microsoft indicated that it was planning to, in conjunction with Intel and other PC makers, spend at least 1 billion US dollars on marketing and promoting Windows XP. The theme of the campaign, "Yes You Can", was designed to emphasize the platform's overall capabilities. Microsoft had originally planned to use the slogan "Prepare to Fly", but it was replaced due to sensitivity issues in the wake of the September 11 attacks. On August 24, 2001, Windows XP build 2600 was released to manufacturing. During a ceremonial media event at Microsoft Redmond Campus, copies of the RTM build were given to representatives of several major PC manufacturers in briefcases, who then flew off on decorated helicopters. While PC manufacturers would be able to release devices running XP beginning on September 24, 2001, XP was expected to reach general, retail availability on October 25, 2001. On the same day, Microsoft also announced the final retail pricing of XP's two main editions, "Home" and "Professional". 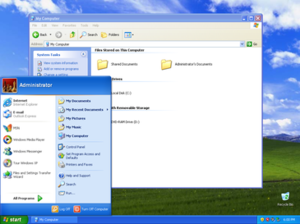 While retaining some similarities to previous versions, Windows XP's interface was overhauled with a new visual appearance, with an increased use of alpha compositing effects, drop shadows, and "visual styles", which completely changed the appearance of the operating system. The number of effects enabled are determined by the operating system based on the computer's processing power, and can be enabled or disabled on a case-by-case basis. XP also added ClearType, a new subpixel rendering system designed to improve the appearance of fonts on liquid-crystal displays. A new set of system icons was also introduced. The default wallpaper, Bliss, is a photo of a landscape in the Napa Valley outside Napa, California, with rolling green hills and a blue sky with stratocumulus and cirrus clouds. The Start menu received its first major overhaul in XP, switching to a two-column layout with the ability to list, pin, and display frequently used applications, recently opened documents, and the traditional cascading "All Programs" menu. The taskbar can now group windows opened by a single application into one taskbar button, with a popup menu listing the individual windows. The notification area also hides "inactive" icons by default. A "common tasks" list was added, and Windows Explorer's sidebar was updated to use a new task-based design with lists of common actions; the tasks displayed are contextually relevant to the type of content in a folder (e.g. a folder with music displays offers to play all the files in the folder, or burn them to a CD). Fast user switching allows additional users to log into a Windows XP machine without existing users having to close their programs and logging out. Although only one user at the time can use the console (i.e. monitor, keyboard and mouse), previous users can resume their session once they regain control of the console. Windows XP uses prefetching to improve startup and application launch times. It also became possible to revert the installation of an updated device driver, should the updated driver produce undesirable results. A copy protection system known as Windows Product Activation was introduced with Windows XP and its server counterpart, Windows Server 2003. All Windows licenses must be tied to a unique ID generated using information from the computer hardware, transmitted either via the internet or a telephone hotline. If Windows is not activated within 30 days of installation, the OS will cease to function until it is activated. Windows also periodically verifies the hardware to check for changes. If significant hardware changes are detected, the activation is voided, and Windows must be re-activated. Windows XP was originally bundled with Internet Explorer 6, Outlook Express 6, Windows Messenger, and MSN Explorer. New networking features were also added, including Internet Connection Firewall, Internet Connection Sharing integration with UPnP, NAT traversal APIs, Quality of Service features, IPv6 and Teredo tunneling, Background Intelligent Transfer Service, extended fax features, network bridging, peer to peer networking, support for most DSL modems, IEEE 802.11 (Wi-Fi) connections with auto configuration and roaming, TAPI 3.1, and networking over FireWire. Remote Assistance and Remote Desktop were also added, which allow users to connect to a computer running Windows XP from across a network or the Internet and access their applications, files, printers, and devices or request help. Improvements were also made to IntelliMirror features such as Offline Files, Roaming user profiles and Folder redirection. Improved application compatibility and shims compared to Windows 2000. DirectX 8.1, upgradeable to DirectX 9.0c. A number of new features in Windows Explorer including task panes, thumbnails and the option to view photos as a slideshow. Improved imaging features such as Windows Picture and Fax Viewer. Faster start-up, (due to improved Prefetch functions) logon, logoff, hibernation and application launch sequences. Numerous improvements to increase the system reliability such as improved System Restore, Automated System Recovery, and driver reliability improvements through Device Driver Rollback. Hardware support improvements such as FireWire 800, and improvements to multi-monitor support under the name "DualView". The ClearType font rendering mechanism, which is designed to improve text readability on liquid-crystal display (LCD) and similar monitors, especially laptops. Side-by-side assemblies and registration-free COM. General improvements to international support such as more locales, languages and scripts, MUI support in Terminal Services, improved Input Method Editors and National Language Support. Some of the programs and features that were part of the previous versions of Windows did not make it to Windows XP. Various MS-DOS commands available in its Windows 9x predecessor were removed, as were the POSIX & OS/2 subsystems. In networking, NetBEUI and NetDDE were deprecated and not installed by default. Plug-and-play–incompatible communication devices (like modems and network interface cards) were no longer supported. Service Pack 2 and Service Pack 3 also removed features from Windows XP but to a less noticeable extent. For instance, support for TCP half-open connections was removed in Service Pack 2, and the address bar on the taskbar was removed in Service Pack 3. Diagram representing the main editions of Windows XP. It is based on the category of the edition (grey) and codebase (black arrow). Windows XP was released in two major editions on launch: Home Edition and Professional Edition. Both editions were made available at retail as pre-loaded software on new computers and as boxed copies. Boxed copies were sold as "Upgrade" or "Full" licenses; the "Upgrade" versions were slightly cheaper, but require an existing version of Windows to install. The "Full" version can be installed on systems without an operating system or existing version of Windows. The two editions of XP were aimed at different markets: Home Edition is explicitly intended for consumer use and disables or removes certain advanced and enterprise-oriented features present on Professional, such as the ability to join a Windows domain, Internet Information Services, and Multilingual User Interface. Windows 98 or ME can be upgraded to either version, but Windows NT 4.0 and Windows 2000 can only be upgraded to Professional. Windows' software license agreement for pre-loaded licenses allows the software to be "returned" to the OEM for a refund if the user does not wish to use it. Despite the refusal of some manufacturers to honor the entitlement, it has been enforced by courts in some countries. Two specialized variants of XP were introduced in 2002 for certain types of hardware, exclusively through OEM channels as pre-loaded software. Windows XP Media Center Edition was initially designed for high-end home theater PCs with TV tuners (marketed under the term "Media Center PC"), offering expanded multimedia functionality, an electronic program guide, and digital video recorder (DVR) support through the Windows Media Center application. Microsoft also unveiled Windows XP Tablet PC Edition, which contains additional pen input features, and is optimized for mobile devices meeting its Tablet PC specifications. Two different 64-bit editions of XP were made available; the first, Windows XP 64-Bit Edition, was intended for IA-64 (Itanium) systems; as IA-64 usage declined on workstations in favor of AMD's x86-64 architecture (which was supported by the later Windows XP Professional x64 Edition), the Itanium version was discontinued in 2005. Microsoft also targeted emerging markets with the 2004 introduction of Windows XP Starter Edition, a special variant of Home Edition intended for low-cost PCs. The OS is primarily aimed at first-time computer owners, containing heavy localization (including wallpapers and screen savers incorporating images of local landmarks), and a "My Support" area which contains video tutorials on basic computing tasks. It also removes certain "complex" features, and does not allow users to run more than three applications at a time. After a pilot program in India and Thailand, Starter was released in other emerging markets throughout 2005. In 2006, Microsoft also unveiled the FlexGo initiative, which would also target emerging markets with subsidized PCs on a pre-paid, subscription basis. As the result of unfair competition lawsuits in Europe and South Korea, which both alleged that Microsoft had improperly leveraged its status in the PC market to favor its own bundled software, Microsoft was ordered to release special versions of XP in these markets that excluded certain applications. In March 2004, after the European Commission fined Microsoft €497 million (US$603 million), Microsoft was ordered to release "N" versions of XP that excluded Windows Media Player, encouraging users to pick and download their own media player software. As it was sold at the same price as the version with Windows Media Player included, certain OEMs (such as Dell, who offered it for a short period, along with Hewlett-Packard, Lenovo and Fujitsu Siemens) chose not to offer it. Consumer interest was minuscule, with roughly 1,500 units shipped to OEMs, and no reported sales to consumers. In December 2005, the Korean Fair Trade Commission ordered Microsoft to make available editions of Windows XP and Windows Server 2003 that do not contain Windows Media Player or Windows Messenger. The "K" and "KN" editions of Windows XP were released in August 2006, and are only available in English and Korean, and also contain links to third-party instant messenger and media player software. A service pack is cumulative update package that is a superset of all updates, and even service packs, that have been released before it. Three service packs have been released for Windows XP. Service Pack 3 is slightly different, in that it needs at least Service Pack 1 to have been installed, in order to update a live OS. However, Service Pack 3 can still be embedded into a Windows installation disc; SP1 is not reported as a prerequisite for doing so. Service Pack 1 (SP1) for Windows XP was released on September 9, 2002. It contained over 300 minor, post-RTM bug fixes, along with all security patches released since the original release of XP. SP1 also added USB 2.0 support, the Microsoft Java Virtual Machine, .NET Framework support, and support for technologies used by the then-upcoming Media Center and Tablet PC editions of XP. The most significant change on SP1 was the addition of Set Program Access and Defaults, a settings page which allows programs to be set as default for certain types of activities (such as media players or web browsers) and for access to bundled, Microsoft programs (such as Internet Explorer or Windows Media Player) to be disabled. This feature was added to comply with the settlement of United States v. Microsoft Corp., which required Microsoft to offer the ability for OEMs to bundle third-party competitors to software it bundles with Windows (such as Internet Explorer and Windows Media Player), and give them the same level of prominence as those normally bundled with the OS. On February 3, 2003, Microsoft released Service Pack 1a (SP1a). It was the same as SP1, except that the Microsoft Java Virtual Machine was removed. Windows Security Center was added in Service Pack 2. Service Pack 2 (SP2) was released on August 25, 2004. Headline features included WPA encryption compatibility for Wi-Fi & usability improvements to the Wi-Fi networking user interface, partial Bluetooth support, and various improvements to security systems. The security improvements (codenamed "Springboard", as these features were intended to underpin additional changes in Longhorn), included a major revision to the included firewall (renamed Windows Firewall, and now enabled by default), and an update to Data Execution Prevention, which gained hardware support in the NX bit that can stop some forms of buffer overflow attacks. Raw socket support is removed (which supposedly limits the damage done by zombie machines) and the Windows Messenger service (which had been abused to cause pop-up advertisements to be displayed as system messages without a web browser or any additional software) became disabled by default. Additionally, security-related improvements were made to e-mail and web browsing. Service Pack 2 also added Security Center, an interface which provides a general overview of the system's security status, including the state of the firewall and automatic updates. Third-party firewall and antivirus software can also be monitored from Security Center. In August 2006, Microsoft released updated installation media for Windows XP and Windows Server 2003 SP2 (SP2b), in order to incorporate a patch requiring ActiveX controls in Internet Explorer to be manually activated before a user may interact with them. This was done so that the browser would not violate a patent owned by Eolas. Microsoft has since licensed the patent, and released a patch reverting the change in April 2008. In September 2007, another minor revision known as SP2c was released for XP Professional, extending the number of available product keys for the operating system to "support the continued availability of Windows XP Professional through the scheduled system builder channel end-of-life (EOL) date of January 31, 2009." The third and final Service Pack, SP3, was released to manufacturing on April 21, 2008, and to the public via both the Microsoft Download Center and Windows Update on May 6, 2008. Service Pack 3 is not available for Windows XP x64 Edition, which is based on the Windows Server 2003 kernel. It began being automatically pushed out to Automatic Updates users on July 10, 2008. A feature set overview which details new features available separately as stand-alone updates to Windows XP, as well as backported features from Windows Vista, has been posted by Microsoft. A total of 1,174 fixes are included in SP3. Service Pack 3 can be installed on systems with Internet Explorer versions 6, 7, or 8; Internet Explorer 7 is not included as part of SP3. Service Pack 3 included security enhancements over and above those of SP2, including APIs allowing developers to enable Data Execution Prevention for their code, independent of system-wide compatibility enforcement settings, the Security Support Provider Interface, improvements to WPA2 security, and an updated version of the Microsoft Enhanced Cryptographic Provider Module that is FIPS 140-2 certified. In incorporating all previously released updates not included in SP2, Service Pack 3 included many other key features. Windows Imaging Component allowed camera vendors to integrate their own proprietary image codecs with the operating system's features, such as thumbnails and slideshows. In enterprise features, Remote Desktop Protocol 6.1 included support for ClearType and 32-bit color depth over RDP, while improvements made to Windows Management Instrumentation in Windows Vista to reduce the possibility of corruption of the WMI repository were backported to XP SP3. In addition, SP3 contains updates to the operating system components of Windows XP Media Center Edition (MCE) and Windows XP Tablet PC Edition, and security updates for .NET Framework version 1.0, which is included in these editions. However, it does not include update rollups for the Windows Media Center application in Windows XP MCE 2005. SP3 also omits security updates for Windows Media Player 10, although the player is included in Windows XP MCE 2005. The Address Bar DeskBand on the Taskbar is no longer included due to antitrust violation concerns. ^ "System requirements for Windows XP operating systems". April 28, 2005. Archived from the original on August 25, 2011. Retrieved March 12, 2007. ^ Even though this is Microsoft's stated minimum processor speed for Windows XP, it is possible to install and run the operating system on early IA-32 processors such as a P5 Pentium without MMX instructions. Windows XP is not compatible with processors older than Pentium (such as 486) because it requires CMPXCHG8B instructions. ^ "Windows XP Minimal Requirement Test". Winhistory.de. September 9, 2011. Archived from the original on December 21, 2011. Retrieved January 1, 2012. ^ a b c d e "Windows XP: Required firmware and partition mapping scheme of hard disk drive". Support.microsoft.com. June 26, 2013. Archived from the original on April 27, 2017. Retrieved June 16, 2014. ^ A Microsoft TechNet paper from Summer 2001 (before Windows XP's actual release), states that: "A computer with 64 MB of RAM will have sufficient resources to run Windows XP and a few applications with moderate memory requirements." (Emphasis added.) These were said to be office productivity applications, e-mail programs, and web browsers (of the time). With such a configuration, user interface enhancements and fast user switching are turned off by default. For comparable workloads, 64 MB of RAM was then regarded as providing an equal or better user experience on Windows XP with similar settings than it would with Windows ME on the same hardware. In a later section of the paper, superior performance over Windows ME was noted with 128 MB of RAM or more, and with computers that exceed the minimum hardware requirements. ^ Sechrest, Stuart; Fortin, Michael (June 1, 2001). "Windows XP Performance". Microsoft TechNet. Archived from the original on July 27, 2010. Retrieved April 8, 2008. ^ "Hard disk space requirements for Windows XP Service Pack 1". Microsoft. October 29, 2007. Archived from the original on April 21, 2012. Retrieved April 6, 2012. ^ "The hard disk space requirements for Windows XP Service Pack 2". Microsoft. April 18, 2005. Archived from the original on November 24, 2010. Retrieved December 1, 2010. ^ "Windows XP - End of Support, Migration Guide, Download - TechNet". technet.microsoft.com. 2007. Archived from the original on May 13, 2008. ^ "Windows XP Professional x64 Edition SP2 VL EN (MSDN-TechNet)". Programmer Stuffs. March 23, 2011. Archived from the original on July 14, 2014. Retrieved May 2, 2012. ^ "Microsoft Windows XP 64-Bit Edition". Microsoft TechNet. Microsoft. August 15, 2001. Archived from the original on April 19, 2012. Retrieved May 2, 2012. The maximum amount of RAM that Windows XP can support varies depending on the product edition and the processor architecture, as shown in the following table. Windows XP Professional supports up to two physical processors; Windows XP Home Edition is limited to one. However, XP supports a greater number of logical processors: 32-bit editions support up to 32 logical processors, whereas 64-bit editions support up to 64 logical processors. Home Edition, Professional Edition, Professional x64 Edition, Professional for Embedded Systems, Media Center Editions (all), Starter Edition, Tablet PC Edition and Tablet PC Edition 2005, as well as Windows Fundamentals for Legacy PCs. Mainstream support ended on June 30, 2005. Mainstream support ended on January 11, 2011. Extended support ended on January 12, 2016. Mainstream support ended on January 14, 2014. Extended support ended on January 8, 2019. Mainstream support ended on April 8, 2014. Extended support ended on April 9, 2019. Support for Windows XP without a service pack ended on September 30, 2005. Windows XP Service Packs 1 and 1a were retired on October 10, 2006, and Service Pack 2 reached end of support on July 13, 2010, almost six years after its general availability. The company stopped general licensing of Windows XP to OEMs and terminated retail sales of the operating system on June 30, 2008, 17 months after the release of Windows Vista. However, an exception was announced on April 3, 2008, for OEMs producing what it defined as "ultra low-cost personal computers", particularly netbooks, until one year after the availability of Windows 7 on October 22, 2010. Analysts felt that the move was primarily intended to compete against Linux-based netbooks, although Microsoft's Kevin Hutz stated that the decision was due to apparent market demand for low-end computers with Windows. Variants of Windows XP for embedded systems have different support policies: Windows XP Embedded SP3 and Windows Embedded for Point of Service SP3 were supported until January and April 2016, respectively. Windows Embedded Standard 2009 and Windows Embedded POSReady 2009 were supported until January and April 2019, respectively. These updates, while intended for the embedded versions, can also be downloaded on standard Windows XP with a registry hack, which enables unofficial patches until April 2019. However, Microsoft advises against Windows XP users installing these fixes. On April 14, 2009, Windows XP exited mainstream support and entered the extended support phase; Microsoft continued to provide security updates every month for Windows XP, however, free technical support, warranty claims, and design changes were no longer being offered. Extended support ended on April 8, 2014, over 12 years since the release of XP; normally Microsoft products have a support life cycle of only 10 years. Beyond the final security updates released on April 8, no more security patches or support information are provided for XP free-of-charge; "critical patches" will still be created, and made available only to customers subscribing to a paid "Custom Support" plan. As it is a Windows component, all versions of Internet Explorer for Windows XP also became unsupported. In January 2014, it was estimated that more than 95% of the 3 million automated teller machines in the world were still running Windows XP (which largely replaced IBM's OS/2 as the predominant operating system on ATMs); ATMs have an average lifecycle of between seven and ten years, but some have had lifecycles as long as 15. Plans were being made by several ATM vendors and their customers to migrate to Windows 7-based systems over the course of 2014, while vendors have also considered the possibility of using Linux-based platforms in the future to give them more flexibility for support lifecycles, and the ATM Industry Association (ATMIA) has since endorsed Windows 10 as a further replacement. However, ATMs typically run the embedded variant of Windows XP, which was supported through January 2016. As of May 2017, around 60% of the 220,000 ATMs in India still run Windows XP. Furthermore, at least 49% of all computers in China still ran XP at the beginning of 2014. These holdouts were influenced by several factors; prices of genuine copies of Windows in the country are high, while Ni Guangnan of the Chinese Academy of Sciences warned that Windows 8 could allegedly expose users to surveillance by the United States government, and the Chinese government would ban the purchase of Windows 8 products for government use in May 2014 in protest of Microsoft's inability to provide "guaranteed" support. The government also had concerns that the impending end of support could affect their anti-piracy initiatives with Microsoft, as users would simply pirate newer versions rather than purchasing them legally. As such, government officials formally requested that Microsoft extend the support period for XP for these reasons. While Microsoft did not comply with their requests, a number of major Chinese software developers, such as Lenovo, Kingsoft and Tencent, will provide free support and resources for Chinese users migrating from XP. Several governments, in particular those of the Netherlands and the United Kingdom, elected to negotiate "Custom Support" plans with Microsoft for their continued, internal use of Windows XP; the British government's deal lasted for a year, and also covered support for Office 2003 (which reached end-of-life the same day) and cost £5.5 million. On March 8, 2014, Microsoft deployed an update for XP that, on the 8th of each month, displays a pop-up notification to remind users about the end of support; however, these notifications may be disabled by the user. Microsoft also partnered with Laplink to provide a special "express" version of its PCmover software to help users migrate files and settings from XP to a computer with a newer version of Windows. Despite the approaching end of support, there were still notable holdouts that had not migrated past XP; many users elected to remain on XP because of the poor reception of Windows Vista, sales of newer PCs with newer versions of Windows declined due to the Great Recession and the effects of Vista, and deployments of new versions of Windows in enterprise environments require a large amount of planning, which includes testing applications for compatibility (especially those that are dependent on Internet Explorer 6, which is not compatible with newer versions of Windows). Major security software vendors (including Microsoft itself) planned to continue offering support and definitions for Windows XP past the end of support to varying extents, along with the developers of Google Chrome, Mozilla Firefox, and Opera web browsers; despite these measures, critics similarly argued that users should eventually migrate from XP to a supported platform. The United States' Computer Emergency Readiness Team released an alert in March 2014 advising users of the impending end of support, and informing them that using XP after April 8 may prevent them from meeting US government information security requirements. Microsoft continued to provide Security Essentials virus definitions and updates for its Malicious Software Removal Tool (MSRT) for XP until July 14, 2015. As the end of extended support approached, Microsoft began to increasingly urge XP customers to migrate to newer versions such as Windows 7 or 8 in the interest of security, suggesting that attackers could reverse engineer security patches for newer versions of Windows and use them to target equivalent vulnerabilities in XP. Windows XP is remotely exploitable by numerous security holes that were discovered after Microsoft stopped supporting it. Similarly, specialized devices that run XP, particularly medical devices, must have any revisions to their software—even security updates for the underlying operating system—approved by relevant regulators before they can be released. For this reason, manufacturers often did not allow any updates to devices' operating systems, leaving them open to security exploits and malware. A patch released May 2014 to address recently discovered vulnerabilities in Internet Explorer 6 through 11 on all versions of Windows. A patch released May 2017 to address a vulnerability that was being leveraged by the WannaCry ransomware attack. On release, Windows XP received critical acclaim. CNET described the operating system as being "worth the hype", considering the new interface to be "spiffier" and more intuitive than previous versions, but feeling that it may "annoy" experienced users with its "hand-holding". XP's expanded multimedia support and CD burning functionality were also noted, along with its streamlined networking tools. The performance improvements of XP in comparison to 2000 and ME were also praised, along with its increased number of built-in device drivers in comparison to 2000. The software compatibility tools were also praised, although it was noted that some programs, particularly older MS-DOS software, may not work correctly on XP due to its differing architecture. They panned Windows XP's new licensing model and product activation system, considering it to be a "slightly annoying roadblock", but acknowledged Microsoft's intent for the changes. PC Magazine provided similar praise, although noting that a number of its online features were designed to promote Microsoft-owned services, and that aside from quicker boot times, XP's overall performance showed little difference over Windows 2000. Despite extended support for Windows XP ending in 2014, many users – including some enterprises – were reluctant to move away from an operating system they viewed as a stable known quantity despite the many security and functionality improvements in subsequent releases of Windows. Windows XP's longevity was viewed as testament to its stability and Microsoft's successful attempts to keep it up to date, but also as an indictment of its direct successor's perceived failings. According to web analytics data generated by Net Applications, Windows XP was the most widely used operating system until August 2012, when Windows 7 overtook it and at the same time, Windows 8 was released to manufacturing. In January 2014, Net Applications reported a market share of 29.23% of "desktop operating systems" for XP (when XP was introduced there was not a separate mobile category to track), while W3Schools reported a share of 11.0%. As of November 2018[update], in most regions, Windows XP market share, as a fraction of the total Windows share, has gone below 4%. XP still has a double-digit market share in a few countries, such as Armenia at 28.88%. At the continental level, Africa has the highest XP market share at 3.59%, with market share in Mauritania at 8.18% and Eritrea at 14.13%. ^ "Windows Licensing Programs". Microsoft. Archived from the original on December 16, 2008. Retrieved September 21, 2008. ^ a b "An Inside Look at the Months-long Process of Getting Windows XP Ready for Release to Manufacturing | Stories". Microsoft Stories. Microsoft. August 24, 2001. Retrieved June 24, 2018. ^ a b Kelly, Gordon. "Windows XP SP3 Release Date(s) Confirmed". Trusted Reviews. Trusted Reviews. Archived from the original on June 23, 2018. Retrieved June 23, 2018. ^ a b c d e f g h i j "Microsoft Product Lifecycle Search: Windows XP". Microsoft Support. Microsoft. Archived from the original on July 20, 2012. Retrieved October 13, 2012. ^ Coursey, David (October 25, 2001). "The 10 top things you MUST know about Win XP". ZDNet. CNET Networks. Archived from the original on December 8, 2015. Retrieved July 22, 2008. ^ Lake, Matt (September 3, 2001). "Windows XP". CNET Review. Archived from the original on November 19, 2001. Retrieved May 29, 2014. ^ "Desktop Windows Version Market Share Worldwide | StatCounter Global Stats". gs.statcounter.com. Statcounter. Retrieved March 23, 2019. ^ "Desktop Windows Version Market Share Armenia | StatCounter Global Stats". StatCounter Global Stats. Retrieved April 8, 2019. ^ Miles, Stephanie (January 24, 2000). "Microsoft consolidates Windows development efforts". CNET. CNET Networks. Archived from the original on February 1, 2014. Retrieved January 23, 2014. ^ "Windows "Longhorn" FAQ". Paul Thurrott's SuperSite for Windows. Penton Media. June 22, 2005. Archived from the original on April 4, 2008. Retrieved April 4, 2008. ^ Thurrott, Paul (October 6, 2010). "The Road to Gold: The development of Windows XP Reviewed". Paul Thurrott's Supersite for Windows. Penton Media. Archived from the original on February 2, 2014. Retrieved January 23, 2014. ^ Thurrott, Paul (July 17, 2000). "Introducing the Whistler Preview, Build 2250". Windows IT Pro. Penton Media. Archived from the original on June 12, 2018. Retrieved June 9, 2018. ^ Thurrott, Paul (October 6, 2010). "The Road to Gold (Part Two)". Paul Thurrott's SuperSite for Windows. Penton Media. Archived from the original on February 2, 2014. Retrieved January 23, 2014. ^ "Microsoft to christen Windows, Office with new name". CNET. CNET Networks. February 5, 2001. Archived from the original on February 1, 2014. Retrieved January 23, 2014. ^ a b "Windows XP marketing tab to hit $1 billion". CNET. CNET Networks. January 2, 2002. Archived from the original on February 1, 2014. Retrieved January 23, 2014. ^ "Microsoft changes XP slogan in wake of US attacks". Computerworld NZ. IDG. Archived from the original on September 5, 2015. Retrieved August 7, 2015. ^ Thurrott, Paul (October 15, 2001). "The Road to Gold (Part Three)". Paul Thurrott's Supersite for Windows. Penton Media. Archived from the original on August 29, 2017. Retrieved March 11, 2017. ^ a b "HOW TO: Use ClearType to Enhance Screen Fonts in Windows XP". Support. Microsoft. October 27, 2002. Archived from the original on August 5, 2011. Retrieved August 8, 2011. ^ Esposito, Dino (November 2001). "New Graphical Interface: Enhance Your Programs with New Windows XP Shell Features". MSDN. Microsoft. Archived from the original on August 9, 2011. Retrieved August 8, 2011. ^ Turner, Paul (February 22, 2004). "No view of Palouse from Windows". The Spokesman-Review. Spokane. Archived from the original on November 16, 2009. Retrieved September 19, 2012. ^ Fitzpatrick, Jason (August 6, 2015). "The Start Menu Should Be Sacred (But It's Still a Disaster in Windows 10)". How-To Geek. Archived from the original on March 13, 2017. Retrieved July 30, 2016. ^ "How To Use the Fast User Switching Feature in Windows XP (Revision 1.5)". Microsoft Support. Microsoft. March 27, 2007. Archived from the original on August 12, 2011. Retrieved August 8, 2011. ^ a b "Kernel Enhancements for Windows XP". Windows Hardware Developer Center (WHDC). Microsoft. January 13, 2003. Archived from the original on March 7, 2008. Retrieved August 8, 2011. ^ "HOW TO: Use the Driver Roll Back Feature to Restore a Previous Version of a Device Driver in Windows XP". Microsoft. October 27, 2002. Archived from the original on February 18, 2006. ^ Fisher, Ken (February 2, 2001). "Windows Product Activation: an early look". Ars Technica. Archived from the original on December 5, 2011. Retrieved February 22, 2017. ^ "Windows XP Networking Features and Enhancements". Microsoft TechNet. Microsoft. August 8, 2001. Archived from the original on July 26, 2011. Retrieved August 8, 2011. ^ "Frequently Asked Questions About Remote Desktop". Microsoft. Archived from the original on July 4, 2007. ^ Otey, Michael (October 2001). "Discover Windows XP". Microsoft Developer. Archived from the original on April 20, 2012. Retrieved June 21, 2018. ^ Proffit, Brian (September 2, 2002). "Old Apps Find A New Home On Windows XP". PC Magazine. Ziff Davis. ^ Karp, David; O'Reilly, Tim; Mott, Troy (2005). Windows XP in a Nutshell : [a desktop quick reference] (2nd ed.). Beijing [u.a. ]: O'Reilly. p. 141. ISBN 978-0-596-00900-7. ^ Richtmyer, Richard (August 23, 2001). "Opening up Windows XP". CNN Money. CNN. Archived from the original on December 23, 2017. Retrieved June 24, 2018. ^ "Windows Picture and Fax Viewer overview". Windows XP Professional Product Documentation. Microsoft Corporation. Archived from the original on 2 December 2010. Retrieved 23 November 2010. ^ Harder, Bobbie (April 2001). "Microsoft Windows XP System Restore". Microsoft. Archived from the original on February 4, 2005. ^ Petri, Daniel (January 8, 2009). "What is ASR in Windows XP and Windows Server 2003?". Petri. Blue Whale Web Media Group. Archived from the original on March 12, 2017. Retrieved June 24, 2018. ^ Columbus, Louis (June 29, 2001). "Exploring Windows XP's Device Driver Rollback and System Restore". InformIT. Pearson Education. Archived from the original on January 5, 2014. Retrieved June 24, 2018. ^ Norton, Peter; Mueller, John Paul (1997). Peter Norton's Complete Guide to Windows XP. Pearson Education. p. N/A. ISBN 9780132715386. ^ McNamee, Kieran (June 27, 2003). "Setting up dual monitors using Windows XP Home". PC World. Archived from the original on February 5, 2017. Retrieved June 24, 2018. ^ "Architecture of Fast User Switching". Microsoft Knowledgebase. Microsoft. January 15, 2006. Archived from the original on August 2, 2009. Retrieved June 24, 2018. ^ Satran, Michael (May 31, 2018). "About Side-by-Side Assemblies". docs.microsoft.com. Microsoft. Archived from the original on June 24, 2018. Retrieved June 24, 2018. ^ Wienholt, Nick (August 14, 2006). "Simplify Application Deployment with Registration-Free COM - Developer.com". www.developer.com. QuinStreet Enterprise. Archived from the original on December 16, 2010. Retrieved June 24, 2018. ^ Honeycutt, Jerry (2003). Introducing Microsoft Windows Server 2003. Redmond, Wash.: Microsoft. pp. 293–298. ISBN 9780735615700. ^ "New ways to do familiar tasks". Windows XP Product Documentation. Microsoft. Archived from the original on May 3, 2006. Retrieved May 21, 2014. ^ "Kernel Enhancements for Windows XP". MSDN. Microsoft. January 13, 2003. Archived from the original on March 6, 2013. Retrieved April 16, 2014. ^ Pittsley, Steven (June 13, 2002). "Easy install guide for NetBEUI and IPX in Windows XP Pro". TechRepublic. CBS Interactive. Archived from the original on April 11, 2017. Retrieved June 24, 2018. ^ "Non-Plug and Play Network Device Support in Windows XP". Support. Microsoft. October 18, 2001. Archived from the original on October 30, 2004. Retrieved November 8, 2012. ^ "TCP/IP Raw Sockets (Windows)". MSDN. Microsoft. Archived from the original on January 28, 2013. Retrieved November 7, 2012. ^ Pash, Adam (April 29, 2008). "Field Guide to Windows XP SP3". Lifehacker. Univision Communications. Archived from the original on January 15, 2018. Retrieved June 24, 2018. ^ "Differences with Windows XP Home Edition". TechNet. Microsoft. September 11, 2009. Archived from the original on February 9, 2014. Retrieved January 26, 2014. ^ Marti, Don (November 6, 2006). "Dell customer gets Windows refund". LinuxWorld. IDG. Archived from the original on September 27, 2008. Retrieved September 13, 2008. ^ "HP must reimburse Italian PC buyer the amount paid for Microsoft software". Heise online. October 29, 2007. Archived from the original on October 15, 2008. Retrieved September 13, 2008. ^ Wilcox, Joe (July 16, 2002). "Microsoft reveals media XP details". CNET. CNET Networks. Archived from the original on February 7, 2015. Retrieved January 26, 2014. ^ Wilcox, Joe; Junnarkar, Sandeep (November 7, 2002). "Microsoft launches tablet PC drive". CNET. CNET Networks. Archived from the original on February 7, 2015. Retrieved January 26, 2014. ^ Evers, Joris (January 5, 2005). "Microsoft nixes Windows XP for Itanium". Computerworld. IDG. Archived from the original on February 2, 2014. Retrieved January 26, 2014. ^ Thurrott, Paul (January 3, 2005). "Windows XP Starter Edition". Paul Thurrott's SuperSite for Windows. Penton Media. Archived from the original on August 28, 2013. Retrieved April 12, 2008. ^ Fried, Ina (May 23, 2006). "Microsoft pitches pay-as-you-go PCs". CNET. CNET Networks. Archived from the original on February 7, 2015. Retrieved January 26, 2014. ^ "Microsoft and EU reach agreement". BBC. March 28, 2005. Archived from the original on September 22, 2015. ^ Bishop, Todd (December 24, 2004). "Europe gets 'reduced' Windows". Seattle Post-Intelligencer. Hearst Corporation. ^ Anderson, Nate (December 7, 2005). "South Korea fines Microsoft for antitrust abuses". Ars Technica. Condé Nast Publications. Archived from the original on April 22, 2008. Retrieved April 12, 2008. ^ "Changes to Windows XP Home Edition K and Windows XP Professional K from earlier versions of Windows XP (MSKB 922474)". Microsoft Support. Microsoft. September 15, 2006. Archived from the original on December 19, 2013. Retrieved January 26, 2014. ^ "Service Pack and Update Center". Support. Microsoft. September 10, 2016. Archived from the original on August 31, 2017. ^ "Installing Windows XP Service Pack 3 (SP3)". Microsoft. Microsoft. November 18, 2011. Archived from the original on August 22, 2017. Retrieved August 22, 2017. ^ Purdy, Kevin. "Slipstream Service Pack 3 into Your Windows XP Installation CD". Lifehacker. Archived from the original on August 22, 2017. Retrieved August 22, 2017. ^ "Windows XP SP1 Irons out the Wrinkles". PC Magazine. Archived from the original on February 26, 2014. Retrieved January 26, 2014. ^ Mendelson, Edward. "Microsoft Windows XP Service Pack 1 review". CNET. CNET Networks. Archived from the original on February 9, 2008. Retrieved January 26, 2014. ^ "Differences Between Windows XP SP1 and Windows XP SP1a". February 3, 2003. Archived from the original on January 27, 2007. Retrieved September 21, 2007. ^ "How to obtain the latest Windows XP service pack". March 26, 2007. Archived from the original on October 14, 2004. Retrieved September 21, 2007. ^ Shinder, Deb (August 26, 2004). "Windows XP Service Pack 2: How it affects wireless networking". TechRepublic. CBS Interactive. Archived from the original on June 13, 2017. Retrieved June 24, 2018. ^ "Bluetooth Wireless Technology FAQ - 2010". July 24, 2012. Archived from the original on March 3, 2016. Retrieved November 4, 2012. ^ Thurrott, Paul (October 15, 2003). "Windows XP SP2 to be 'Springboard' to Longhorn". Windows IT Pro. Archived from the original on June 23, 2018. ^ "Windows XP Service Pack 2 information". Microsoft. August 4, 2004. Archived from the original on October 16, 2007. ^ Mux, Victor (August 21, 2006). "Why Windows XP SP2b and Windows Server 2003 SP2a?". Microsoft. Archived from the original on August 12, 2009. ^ Fletcher, Jefferson (April 8, 2008). "IE Automatic Component Activation Now Available". IEBlog. Microsoft. Archived from the original on April 11, 2008. Retrieved April 11, 2008. ^ Mux, Victor (August 9, 2007). "Microsoft Windows XP Professional Service Pack 2c Release". MSDN. Microsoft. Archived from the original on February 2, 2014. Retrieved January 26, 2014. ^ Oiaga, Marius (December 14, 2007). "64-Bit Windows XP Service Pack 3?". Softpedia. SoftNews NET. Archived from the original on May 8, 2018. Retrieved June 24, 2018. ^ Keizer, Gregg (July 8, 2008). "Microsoft sets XP SP3 automatic download for Thursday". Computerworld. IDG. Archived from the original on July 9, 2008. Retrieved July 8, 2008. ^ "Windows XP Service Pack 3 Overview". Microsoft. May 6, 2008. Archived from the original on May 6, 2008. Retrieved May 7, 2008. ^ "List of fixes that are included in Windows XP Service Pack 3". Microsoft. May 6, 2008. Archived from the original on May 9, 2008. Retrieved June 23, 2018. ^ Oiaga, Marius (December 14, 2007). "No, Internet Explorer 7 Will Not(!) Be a Part of Windows XP SP3". SoftNews NET. Archived from the original on January 18, 2012. ^ Howard, Michael (January 29, 2008). "New NX APIs added to Windows Vista SP1, Windows XP SP3 and Windows Server 2008". Michael Howard's Web Log. Microsoft. Archived from the original on August 25, 2011. Retrieved August 8, 2011. ^ "Description of the Credential Security Support Provider (CredSSP) in Windows XP Service Pack 3". Microsoft. May 6, 2008. Archived from the original on October 9, 2009. Retrieved June 23, 2018. ^ Enterprise IT Planet Staff (May 13, 2005). "Upgraded Wi-Fi Security for Windows XP SP2". Wi-Fi Planet. QuinStreet Enterprise. Archived from the original on June 23, 2018. Retrieved June 23, 2018. ^ "Overview of Windows XP Service Pack 3" (PDF). Archived (PDF) from the original on January 17, 2009. ^ "Information about Windows Imaging Component". Microsoft. August 13, 2002. Archived from the original on May 10, 2011. ^ Nanjappa, Ashwin (January 27, 2010). "Windows: ClearType on RDP". CodeYarns.com. Archived from the original on November 17, 2015. Retrieved June 16, 2014. ^ "A hotfix is available that improves the stability of the Windows Management Instrumentation repository in Windows XP". Support. Microsoft. October 8, 2011. Archived from the original on March 5, 2013. Retrieved January 20, 2013. ^ a b "FAQs regarding SP3 RTM". Microsoft. April 22, 2008. Archived from the original on August 24, 2011. Retrieved June 23, 2018. ^ Kaelin, Mark (May 8, 2008). "How do I... Return the Address bar Windows XP SP3 removed?". TechRepublic. CBS Interactive. Archived from the original on September 5, 2015. Retrieved May 5, 2015. ^ "What is the maximum amount of RAM the Windows operating system can handle?". Crucial. Archived from the original on May 11, 2011. Retrieved June 25, 2010. ^ "Physical Memory Limits: Windows XP". Memory Limits for Windows Releases. Microsoft. Archived from the original on January 6, 2014. Retrieved January 14, 2014. ^ "Processor and memory capabilities of Windows XP Professional x64 Edition and of the x64-based versions of Windows Server 2003 (Revision 7.0)". Microsoft Support. Microsoft. December 20, 2010. Archived from the original on August 12, 2011. Retrieved August 8, 2011. ^ Kumar, I. Suuresh (October 25, 2010). "Multi-core processor and multiprocessor limit for Windows XP". Microsoft Answers. Microsoft. Archived from the original on April 19, 2014. Retrieved April 18, 2014. ^ "Processor Affinity Under WOW64". MSDN. Microsoft. January 27, 2011. Archived from the original on May 6, 2011. Retrieved August 8, 2011. ^ "Maximum quantity of logical processors in a PC supported by Microsoft Windows XP professional, x64 edition". Support. Microsoft. December 20, 2010. Archived from the original on January 11, 2013. Retrieved January 20, 2013. ^ "Microsoft Product Lifecycle Search: Windows Fundamentals for Legacy PCs". Microsoft Support. Microsoft. Archived from the original on October 5, 2014. Retrieved October 13, 2012. ^ "Microsoft Security Bulletin MS05-036 - Critical". July 12, 2015. Archived from the original on April 26, 2018. Retrieved April 26, 2018. ^ a b Mackie, Kurt (February 19, 2014). "Windows XP Embedded Supported for Two or More Years". Redmond Magazine. 1105 Media. Archived from the original on February 20, 2017. Retrieved June 23, 2018. ^ "Microsoft Product Lifecycle Search: Windows Embedded Standard 2009". Microsoft Support. Microsoft. Archived from the original on July 13, 2015. Retrieved October 13, 2012. ^ "Microsoft Product Lifecycle Search: Windows Embedded POSReady 2009". Microsoft Support. Microsoft. Archived from the original on October 10, 2014. Retrieved October 13, 2012. ^ Fried, Ina (September 27, 2007). "Microsoft extends Windows XP's stay". CNET. CBS Interactive. Archived from the original on August 30, 2008. Retrieved June 5, 2008. ^ Lai, Eric (March 3, 2008). "Microsoft to keep Windows XP alive—but only for Eee PCs and wannabes". ComputerWorld. IDG. Archived from the original on April 8, 2008. Retrieved April 8, 2008. ^ Tung, Liam (February 18, 2014). "Microsoft: 'Remember, some XP-based embedded systems to get support to 2019'". ZDNet. CBS Interactive. Archived from the original on April 4, 2014. Retrieved April 6, 2014. ^ Newman, Jared (August 27, 2014). "Enthusiast developer keeps Windows XP alive with unofficial 'Service Pack 4'". PCWorld. Archived from the original on October 26, 2018. Retrieved October 26, 2018. ^ "Businesses urged to ditch XP". 3 News NZ. April 9, 2013. Archived from the original on July 13, 2014. ^ Keizer, Gregg (August 26, 2013). "Microsoft will craft XP patches after April '14, but not for you". Computerworld. IDG. Archived from the original on October 20, 2013. Retrieved December 12, 2013. ^ a b Keizer, Gregg (March 11, 2014). "US-CERT urges XP users to dump IE". Computerworld. IDG. Archived from the original on March 15, 2014. Retrieved April 6, 2014. ^ ATM Industry Association (collectively) (June 1, 2015). "ATMIA position paper recommending migration to Windows 10". www.atmia.com (Press release). ATM Industry Association. Archived from the original on May 25, 2017. ^ Summers, Nick (January 16, 2014). "ATMs Face Deadline to Upgrade From Windows XP". Bloomberg Businessweek. Bloomberg L.P. Archived from the original on January 16, 2014. Retrieved January 17, 2014. ^ "Wannacry ransomware cyber attack: Indian ATMs could be at high risk as most run on Windows XP". Business Today. May 15, 2017. Archived from the original on May 17, 2017. Retrieved May 18, 2017. ^ "Windows 8 a 'threat' to China's security". BBC. June 5, 2014. Retrieved October 8, 2018. ^ Kan, Michael (May 20, 2014). "China bans government purchases of Windows 8". PCWorld. IDG. Archived from the original on May 20, 2014. Retrieved May 20, 2014. ^ Reuters (April 9, 2014). "Microsoft Partners Lenovo, Tencent to Offer XP Tech Support in China". Voanews.com. Archived from the original on April 13, 2014. Retrieved April 16, 2014. ^ Gallagher, Sean. "Not dead yet: Dutch, British governments pay to keep Windows XP alive". Ars Technica. Condé Nast Publications. Archived from the original on April 7, 2014. Retrieved April 6, 2014. ^ Foley, Mary Jo (March 3, 2014). "Microsoft to start nagging Windows XP users about April 8 end-of-support date". ZDNet. CBS Interactive. Archived from the original on March 4, 2014. Retrieved March 4, 2014. ^ Yegulalp, Serdar (March 3, 2014). "Microsoft: Use Laplink's Windows XP migration tools, not ours". Infoworld. Archived from the original on April 6, 2014. Retrieved April 8, 2014. ^ Ward, Mark (March 5, 2014). "XP – the operating system that will not die". BBC News. Archived from the original on March 24, 2014. Retrieved March 25, 2014. ^ Egan, Matt (April 7, 2014). "What should XP users do when Microsoft ends support? Upgrade to Windows 8, buy a new PC, keep running XP?". PC Advisor. Archived from the original on February 14, 2014. Retrieved April 6, 2014. ^ "Alert (TA14-069A): Microsoft Ending Support for Windows XP and Office 2003". March 11, 2014. Archived from the original on March 16, 2014. Retrieved April 6, 2014. ^ Keizer, Gregg (January 19, 2014). "Microsoft will furnish malware assassin to XP users until mid-2015". Computerworld. IDG. Archived from the original on January 22, 2014. ^ "Microsoft Warns of Permanent Zero-Day Exploits for Windows XP". Infosecurity. Reed Exhibitions. August 20, 2013. Archived from the original on August 26, 2013. Retrieved August 27, 2013. ^ "Microsoft Security Bulletin MS15-011 JASBUG". February 10, 2015. Archived from the original on August 11, 2015. Retrieved September 18, 2015. ^ Freeman, Robert (November 11, 2014). "IBM X-Force Researcher Finds Significant Vulnerability in Microsoft Windows". Securityintelligence.com. Archived from the original on July 3, 2015. Retrieved September 18, 2015. ^ Talbot, David (October 17, 2012). "Computer Viruses Are "Rampant" on Medical Devices in Hospitals". MIT Technology Review. Archived from the original on October 19, 2016. Retrieved April 6, 2014. ^ Goodin, Dan (May 1, 2014). "Emergency patch for critical IE 0-day throws lifeline to XP laggards, too". Ars Technica. Conde Nast. Archived from the original on May 17, 2017. Retrieved May 26, 2017. ^ Warren, Tom (May 13, 2017). "Microsoft issues 'highly unusual' Windows XP patch to prevent massive ransomware attack". The Verge. Vox Media. Archived from the original on May 14, 2017. Retrieved May 13, 2017. ^ Lake, Matt (October 10, 2002). "Microsoft Windows XP – Home Edition review:". CNET. Archived from the original on May 31, 2007. Retrieved March 25, 2014. ^ Mendelson, Edward (September 3, 2001). "Microsoft Ships Its Biggest OS Upgrade Ever—Early!". PC Magazine. Archived from the original on March 25, 2014. Retrieved March 25, 2014. ^ Bright, Peter (October 25, 2011). "Ten years of Windows XP: how longevity became a curse". Ars Technica. WIRED Media Group. Archived from the original on June 12, 2018. Retrieved June 9, 2018. ^ "Operating system market share". September 9, 2012. Archived from the original on September 9, 2012. Retrieved September 8, 2018. ^ Crothers, Brooke (February 2, 2014). "Oops, Windows XP gains in January but so does Windows 8.1". CNET. CBS Interactive. Archived from the original on February 21, 2014. Retrieved March 16, 2014. ^ "OS Platform Statistics". w3schools. Archived from the original on September 17, 2015. Retrieved September 14, 2015. ^ "Desktop Windows Version Market Share Armenia | StatCounter Global Stats". StatCounter Global Stats. Retrieved November 30, 2018. ^ "Desktop Windows Version Market Share Africa | StatCounter Global Stats". StatCounter Global Stats. Retrieved November 30, 2018. ^ "Desktop Windows Version Market Share Mauritania | StatCounter Global Stats". StatCounter Global Stats. Retrieved September 8, 2018. ^ "Desktop Windows Version Market Share Eritrea | StatCounter Global Stats". StatCounter Global Stats. Retrieved November 30, 2018. Wikimedia Commons has media related to Microsoft Windows XP. Joyce, Jerry; Moon, Marianne (2004). Microsoft Windows XP Plain & Simple. Microsoft Press. ISBN 978-0-7356-2112-1.